Listen: You can hear Curry make the comments in this podcast called "Winging It." They come after the 46-minute mark, when Curry asks, "We ever been to the moon?" 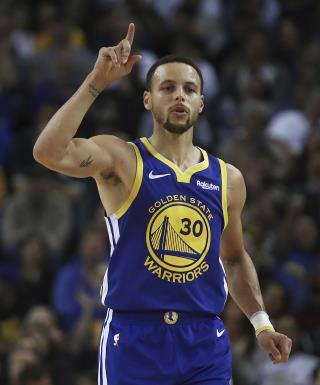 A number of voices chime in, saying no, and Curry says, "I don't think so, either," reports the San Francisco Chronicle. He adds, “Sorry, I don't want to start conspiracies," per the New York Times. Kubrick: Host Annie Finberg gives Curry a chance to backtrack. "You don't think so?" she asks. "Nuh uh," he responds. Then fellow NBA player Kent Bazemore adds, "You gotta do the research on Stanley Kubrick." The reference is to the conspiracy theory that the director helped NASA concoct the moon landings. Well Donald Trump faked all you out in getting elected, He bought off people, Had Hush money paid, Had corporations changing stories in the media. .So AnYTHING , ANYTHING is possible with Trumpettes at the wheel and a weak GOP leadership allowing him to do anything he wants. I wonder if that would disqualify someone from serving on a jury ?